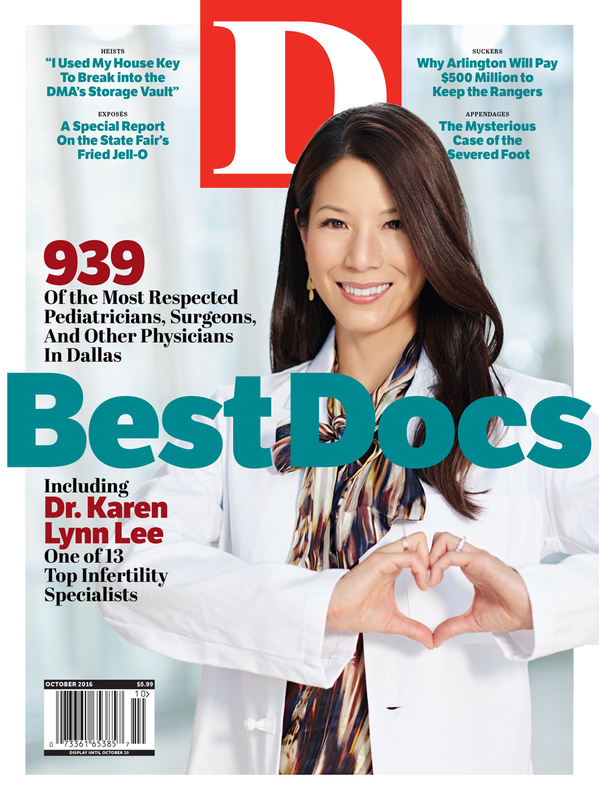 By D Magazine | 3 years ago The top physicians in their field, as chosen by their peers. By Geoffrey C. Orsak | 3 years ago This UTD engineer is saving people from endless misery. By Brooks Egerton | 3 years ago It turned up in an Oak Cliff Creek, still wearing a Nike Air Jordan. Finding its owner became my obsession. By Alice Laussade | 3 years ago A special investigation into the State Fair's Big Tex Choice Awards. By Brantley Hargrove | 3 years ago Dr. Kris Guleserian, one of the best pediatric heart surgeons in the country, knows what it's like to lose someone. By Jamie Thompson | 3 years ago After the downtown shooter sent wounded cops to his hospital, Dr. Brian Williams wound up at the center of a national conversation. By S. Holland Murphy | 3 years ago Sometimes less costs more. That’s the ultimate luxury. By Julia Trupp | 3 years ago Heidi Berthiaume tries to help people add depth and shading to their lives. By S. Holland Murphy | 3 years ago Armed with his wife's sewing machine, Stephen Holley figured he could craft better camo. By Eve Hill-Agnus | 3 years ago The Arts District’s new hit sculpture is in a restaurant. By Nancy Nichols | 3 years ago Can't we learn to co-exist with these beautiful birds? By Eve Hill-Agnus | 3 years ago Skip the paella and go for traditional tapas at its new Farmers Market location. By Kathy Wise | 3 years ago A lawyer and her wife seek help in rebuilding their wardrobes. By Zac Crain | 3 years ago For your nightstand: a magical Old West comic, a boozy science lesson, the debut from Mexico's answer to Aldous Huxley, and an insider's look at the classical music world. By Zac Crain | 3 years ago An important, untold City Hall story. By Catherine Downes | 3 years ago Graham Dodds offers a vegan take on a Texas classic. By Tim Rogers | 3 years ago Is this story a thinly veiled cry for help? Not at all. Nope. Uh-uh. By S. Holland Murphy | 3 years ago Puzzle rooms offer the key to adventure for thrill-seekers. By Tara Nieuwesteeg | 3 years ago After its reopening, is it the same dive you remember? By D Magazine | 3 years ago The Plano marketing strategist on what she loves in our city. By Eve Hill-Agnus | 3 years ago Chef Matt McCallister still manages to surprise. By Peter Simek | 3 years ago Nan Ellin is planning the future of North Texas. And she’s doing it in, of all places, Arlington. By Peter Simek | 3 years ago Forget support for cultural programming. The city can't even afford basic repairs. By Eric Celeste | 3 years ago The team will stay put, despite Dallas' best efforts to steal them way. By Stephanie Quadri | 3 years ago If you're going to buy into a trend, then choose one (or, say, 17) that goes with just about everything. By Zac Crain | 3 years ago M83 took her on a world tour. She and the band return to Dallas this week. Which Ride-Sharing App Works Best in Dallas? By Katelyn Lunders | 3 years ago We took four for a spin. By Eve Hill-Agnus | 3 years ago A Deep Ellum watering hole sneaks French technique and classicism onto its menu. By D Magazine | 3 years ago Tops for your kids, as chosen by their peers.